A conservatorship grants court-appointed people the power to make estate planning decisions for someone who is incapacitated and unable to manage their affairs. 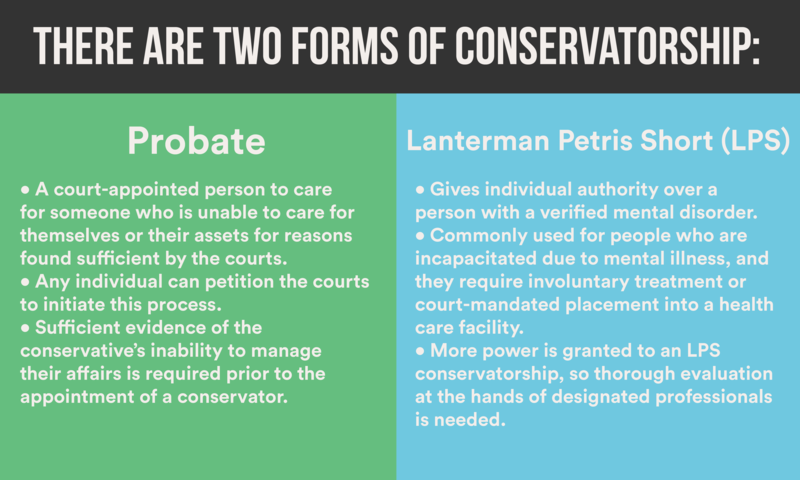 There are two forms of conservatorship: Probate Conservatorship and Lanterman Petris-Short Conservatorship. 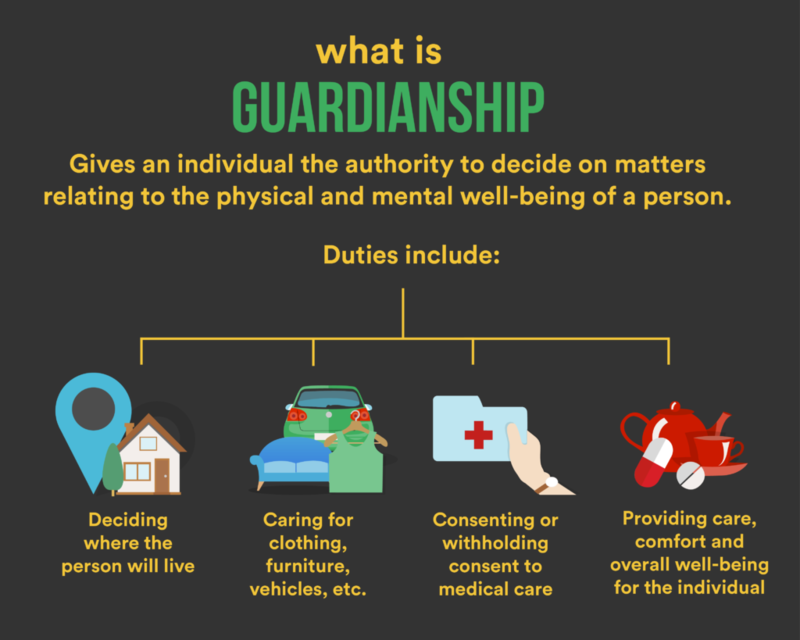 A guardianship gives an individual the authority to decide on physical and mental matters of someone who is deemed unable to do so by the courts. Reasons for conservatorship or guardianship appointments include: Alzheimer’s disease, other types of dementia, coma and mental illness. There are vetting procedures in place to protect wards (often a child or an older adult) and their assets. There are other ways for an individual, providing they are of sound mind, to choose an agent to care for their affairs such as Power of Attorney or Revocable Trust. An individual’s capabilities are prone to change over the span of a lifetime, and while people in general may have an innate desire to maintain their autonomy and independence indefinitely, the realities of aging and illness often create obstacles to autonomy. When the time comes that it is found that an elder loved one is no longer able to make sound decisions regarding their health needs and best financial interests, appointing a guardian or conservator to act on their behalf often becomes the best solution. We hope this article will serve as a resource for individuals who are in the process of deciding whether to avail themselves of this option, and to shed light on the workings of guardianships and conservatorships. 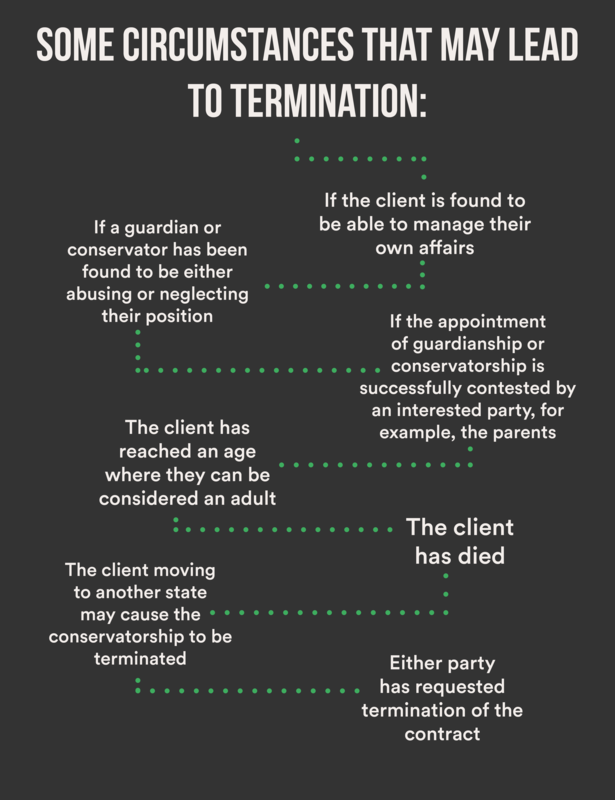 A conservatorship, also referred to as a guardianship of the estate, typically grants one or more court-appointed people the power to make estate planning decisions on financial matters for someone who is found to be unable to manage his or her affairs due to infirmity or impairment. This entails a court-appointed person to care for individuals who are unable to care for themselves or their assets for reasons found sufficient by the courts. Any individual can petition the courts to initiate this process. Sufficient evidence of the conservatee’s inability to manage his or her affairs is required prior to the appointment of a conservator. A probate conservator’s appointment is usually permanent. This is a specific type of conservatorship that gives an individual authority over a person with a verified mental disorder that is found in the Diagnostic and Statistical Manual of Mental Disorders(DSM), a list of diagnosed mental illnesses. These are commonly used for people who are incapacitated due to mental illness, and they require involuntary treatment or court-mandated placement into a health care facility. Because more power is granted to an LPS conservatorship, a thorough evaluation at the hands of designated professionals is needed to initiate the process. The conservatorship is granted for 30 days initially and, if needed, thereafter extended for a year, with annual extensions upon re-applying. Investigate the parties involved, including potential guardians, wards, and other relevant persons. A petition for guardianship or conservatorship is prepared and filed to the appropriate court. A request is made prior to the hearing, when needed, for a temporary guardian to act as fiduciary for the ward. The concerned parties are notified of an upcoming hearing; these would include other potential conservators or guardians, the potential conservatee, family members, partners or spouses, and other interested entities. A court-appointed investigator reports their findings to the court. A hearing will then be held approximately two months after the position has been filed to determine if a conservatorship or guardianship has been awarded, and the extent of its powers. If the conservatee or another interested entity has an issue with the court’s previous decision, and they wish to alter or reverse it, then the necessary documents for an appeal must be submitted to the court of appeals. Appointing a guardian or conservator can be difficult and costly, and one of the more difficult aspects of this process can be the task of vetting those interested and qualified to hold this position. Those who tend to be granted the position of guardian or conservator are usually competent and interested members of one’s family or court-appointed attorneys. Given the high potential for exploitation or misuse that such an appointment would afford a guardian or conservator, individuals with outstanding debts or criminal records are eliminated as a matter of course. The conditions that must be met by potential guardians and conservators have been the subject of federal inquiries. The Government Accountability Organization(GAO) continually look into the prevalence of exploitation, neglect and abuse of seniors in the guardianship system, and why these misuses of authority are possible. GAO investigators focus on instances in which guardians used their power to embezzle or misappropriate, or those who stole or improperly obtained assets from incapacitated victims. The individual must be 18 years of age or older to hold this position. They must understand and be able to execute their duties. They must be of sound mind. They must demonstrate the ability to create a suitable care plan. They must agree to have a full background checks performed. They must have no felony convictions. They must not have a history of abuse or neglect. They may need prior experience or education in performing the tasks that come with this appointment. They may be required to obtain licenses and/or certifications prior to be granted guardianship. In March of 2008, a guardian embezzled over $640,000 from their charge, an 87-year old man in Missouri. Authorities found the victim living in filthy conditions and severely dehydrated. The guardian was sentenced to 8 years in prison and ordered to pay restitution for all that he had stolen. This case was particularly problematic because the guardian was a convicted felon, yet was able to gain control of the victim’s affairs by claiming to be the senior’s prior caretaker. A District of Columbia guardian violated the obligations conferred upon her by entrusting her responsibilities to her secretary who misappropriated almost $50,000 from two older individuals who were supposed to be under the care of her boss; one of these women lost her home due to unpaid property taxes. Two public guardians for a county government in California pilfered over $97,000 from 20 public wards. Exploitation of these vulnerable individuals was able to continue partially because of substandard court supervision of cases handled by the Public Guardian’s Office. Considering the court’s poor management, it is not unlikely that they stole from more people as well. A power of attorney is a document in which an individual, referred to as the principal or grantor, appoints someone else, referred to as the agent or attorney-in-fact. The attorney-in-fact is granted the ability to act on behalf of the principal in the capacity specified in the document on certain matters, such as financial, business, medical, legal, and more. 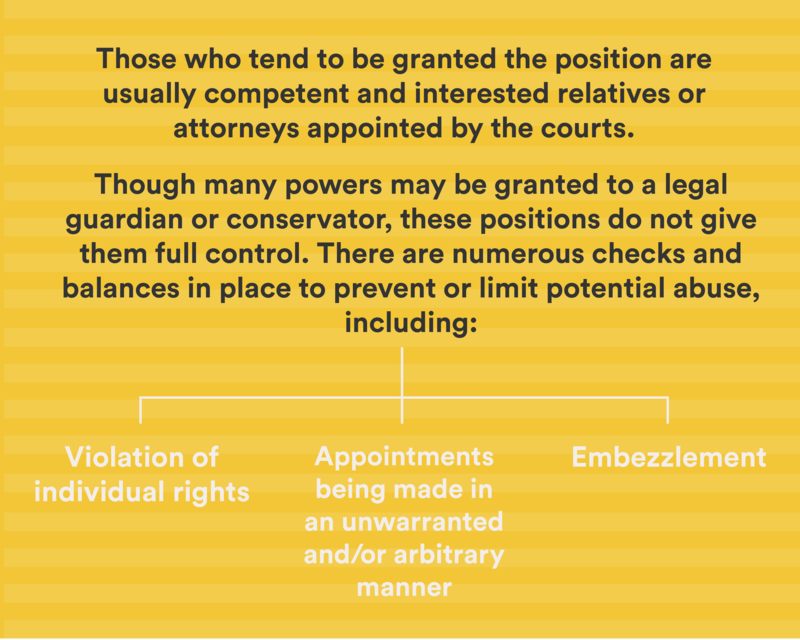 Though these powers tend to be limited and will expire if the person is medically incapacitated or dies, the person can determine when and how their agent can utilize their powers depending on what they believe they require. A durable power of attorney is a type of power of attorney that grants an agent the authority to act on the grantor’s behalf to some degree even after they have become incapacitated. This document endows an individual with the right to make healthcare decisions for the principal when they are unable to give consent or their ability to do so is limited to a sufficient degree. A revocable trust can be put in place with a reliable entity or set of entities serving as trustees to hold the assets of another person. This is an individual or organization assigned to handle payments from welfare or other entitlement programs for another person who is unable to manage them. Because conservatorships and guardianships entail such high levels of trust and responsibilities, families seeking to protect loved ones from an uncertain future need to exercise utmost due diligence and careful planning. 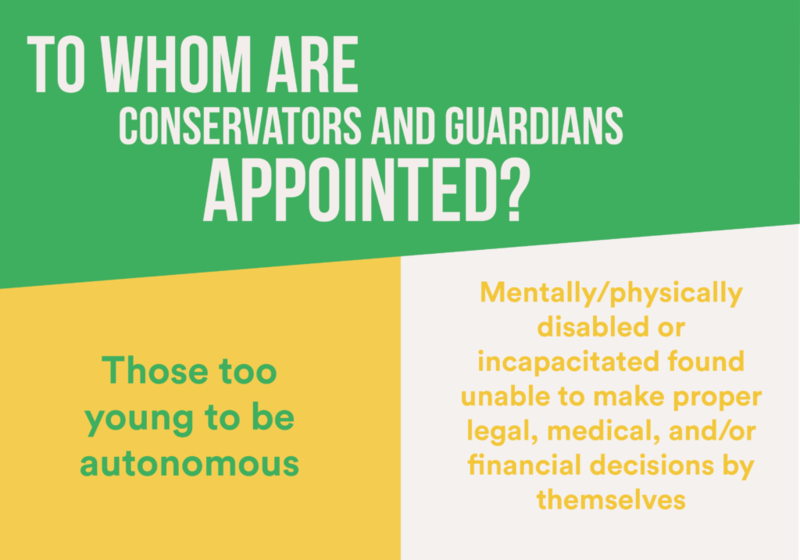 Appointing a guardian or conservator can be helpful, but it should by no means be the first or only course of action pursued by those who look after a loved one who is incapacitated. If you are considering this avenue, the first thing to do is to educate yourself as much as possible and, if feasible, consult a lawyer or elder care attorney. As you are likely aware, matters concerning the care of loved ones are not trifle matters and, when handled carelessly, can be incredibly costly. Make sure to educate yourself about your options and seek the counsel of an attorney so you can be as informed and prepared as possible. Conservatorship: When an individual is given the authority to manage the affairs of someone who has been determined unfit to make decisions regarding their estate. Conservator: An individual granted the authority to act on behalf of another in regard to their estate due to a reduction in capacity to manage their financial affairs. Conservatee: The person who has been deemed unfit to act in their best financial interests. 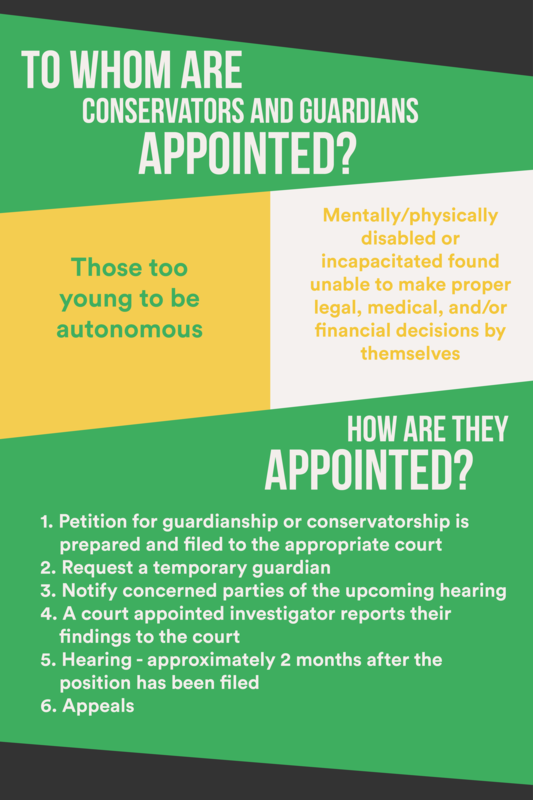 Guardianship: When someone is authorized to make legal, financial, and healthcare decisions on behalf of a person who has been found incapable to make such choices. Guardianship of a person: An individual charged with the management of a court-protected person’s physical and mental needs. Guardianship of estate: An individual who has been tasked with the management and care of their ward’s assets. Plenary guardianship: A guardianship of the person and estate. Guardian ad litem: A court-appointed person to act as a fiduciary for an incapacitated individual and provide information during legal proceedings. Guardian: An individual who is given the authority to make legal, financial, and health care choices for someone who is incapacitated. Ward: Person who requires a guardian, due to a lack of capacity. Estate (legal): The totality of a person’s assets. Capacity: The ability to act in some manner.